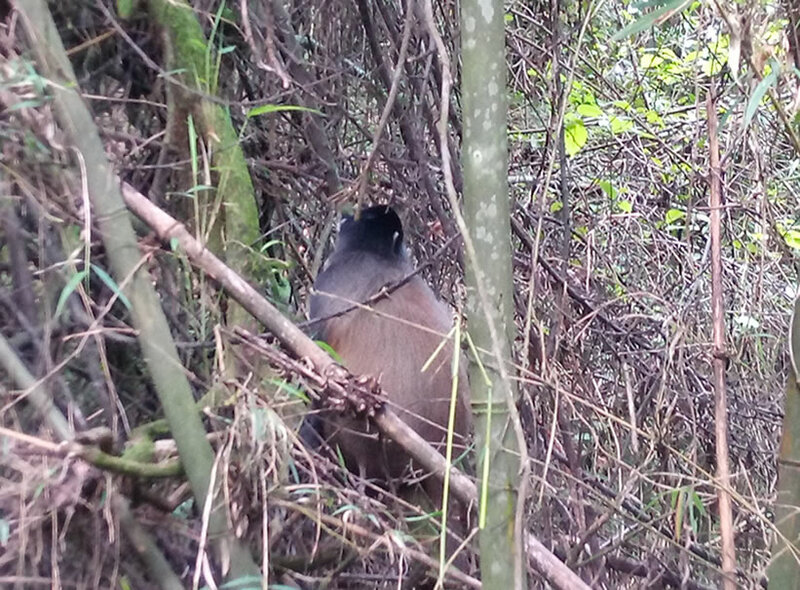 Mgahinga National Park offers the chance to track the golden monkeys (Ceropithecus Kandti) sometimes referred to as a distinctive race of the more widespread blue monkey C.mitis), a little known bamboo-associated taxa primate listed as ‘endangered’ by the World Conservation Union. Endemic to the Albertine Rift, the golden monkey is characterized as a bright orange-gold body, cheeks and tail, contrasting with its black limbs, crown and tail end. 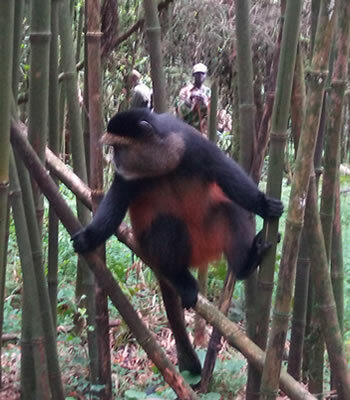 Until a few years ago, this pretty monkey was common in Rwanda’s Gishwati Forest Reserve, most of which was chopped down by returned refugees in the aftermath of the 1994 genocide and unconfirmed sources indicate that a small population might occur further south in the same country’s Nyungwe Forest National Park. Fortunately, the golden monkey is the numerically dominant primate within this restricted range – a 2003 survey estimated a population of 3,000 – 4,000 in Mgahinga National Park. These primates are endangered and endemic to this region, sharing their home with the world famous Mountain Gorilla, as well as buffalo, forest elephant and other species of mammals, reptiles, amphibians and birds. In the beginning and for many months to follow it was very difficult to even find the monkeys owing to the fact that unlike gorillas they are small, do not make nests and leave little evidence of their presence on the forest floor, and at times can be quiet especially in the presence of their main predator the eagle. Also not been used to us they would just run away. The group is very much used to our presence now, allowing us to have an insight into their daily lives. The monkeys dictate how the day is going to be, and no day is ever the same in the forest. We just never know how the working day is going to turn out, and this is what makes the experience so exciting. You will encounter challenges regularly. One of our biggest problems is the weather. Trekking at an altitude of around 2,500 meters you will encounter strong winds, heavy rainfall and extreme coldness, so is the best place to trek the golden monkey or gorillas though not reliable. The weather really does make a difference to how the day is going to be. Wind makes it conducive to track the monkeys as trek the slopes, they stay quiet and in mid canopy because they have problems hearing predators and when the trees blow you do not know if it is monkey moving or wind blowing, or both. When it rains the monkeys take shelter and do not move, hence closer view of them. No matter how the weather conditions are, the forests walk every day, even public holiday is awesome. With all that, when it rains in the forest and the mist comes down among the moss and overhanging vegetation it is certainly the most beautiful place to be. u spend with the golden monkeys. These permits can be booked on ground from the Park headquarters in Ntebeko Visitor Center. Tourists who wish to spend more quality time and understand the detailed information regarding the golden monkeys can visit this Park for the engaging golden monkey habituation experience that costs only $100 per person. e gorilla trekking, golden monkey tracking starts with tourists arriving at the Park headquarters by 7:30am for pre-tracking briefing (on the dos and don’ts of tracking the golden monkeys). The actual trek begins at 8:00am. Hiking through the forests to sight the golden monkeys is not so strenuous like gorilla trekking because golden monkeys live in lower areas, so tourists do not track for more than 3 hours. When tourists encounter the golden monkey family, they are given one hour to spend with them (to take photographs and observe their behavior). With this activity, there is no minimum number of tourists who track each group and age limit is 12 years. What to carry during golden monkey tracking. 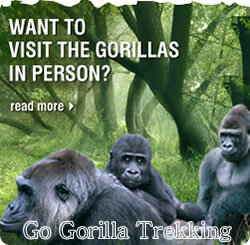 There are several requirements that tourists need to have a memorable experience during golden monkey tracking. These include waterproof hiking boots, wear long sleeved shirt, long trousers, and carry a backpack for your lunch and documents. Also carry drinking water and snacks, carry a walking stick to support you during hiking, you can hire a porter to support you during hiking in slippery places and they carry your backpack, and do not forget to carry an insect repellant.